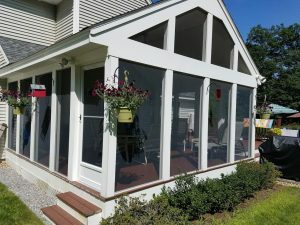 One of our most popular offerings is the good old fashioned screen porch enclosure. With multiple frame styles and colors to choose from, we can help you put the finishing touch on that outdoor living space by helping to make it pest free, while also keeping it simple with low maintenance screens that are easy to service if and when that time comes for re-screening. Many great examples can be reviewed by checking out the gallery. If you want to get an even longer season out of your screen porch, check out our “3 Season Porch” section. Repair services also available.